Organized by the Custodian of Two Holy Mosques Institute for Hajj and Umrah Research , and on behalf of Prof. Dr. Abdullah bin Omar Bafil, President of Umm Al-Qura University (UQU), Dr. Yasser bin Suleiman Shosho, UQU Vice-President, launched the Annual Meeting of Researchers during the season of Ramadan 1439H to discuss 30 studies and programs. The event was held at the Research Tent in the Institute’s premises in Al-Aziziyah, in the presence of Dr. Sami bin Yaseen Barhamain (Dean of the Institute), a number of officials from the relevant governmental and private sectors, in addition to the Institute’s vice-deans, researchers and employees. The ceremony started with a Quranic recitation followed by the speech of Dr. Barhamain. He stressed that via such annual meeting held under the patronage and with the support of Prof. Dr. Bafil 30 ongoing studies and programs were being carried out this year. Such studies and programs required in-depth field work to collect and analyze data, carry out measurements and take samples from the environment of the Grand Mosque and the Prophet's Mosque and the squares thereof, in addition to the means of transport leading to them. He added that the Institute’s field studies covered all aspects related to the Hajj, Umrah and visit system. 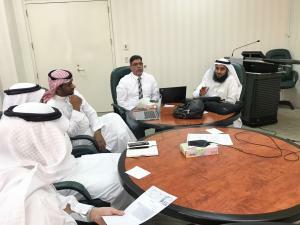 This was in the engineering and urban, administrative and humanitarian, environmental and health, media and awareness, technology and informatics domains in line with the aspirations and expectations of the Saudi Vision 2030. In addition, Dr. Barhamain extended deep thanks and gratitude to Dr. Shosho for his attendance and inauguration of the event. He also hailed the efforts exerted by the Institute’s researchers and employees. This was followed by a presentation by Dr. Abdullah Al-Seba’ey on the Institute’s achievements and participations in 1439H. This was followed by a presentation by Dr. Othman Qazzaz, Head of the Department of Media Affairs and Researches, on the study of experiencing the interactive touch screens and their role in raising awareness during the journey of the pilgrim and visitor. Moreover, Dr. Atef Asghar gave a presentation on the study of pilgrims’ health environment assessment. Then, Dr. Khaled Usra, Head of the Department of Architectural Engineering Research, demonstrated the Institute’s studies in the domains of transportation and crowd management. This was followed by a presentation by Dr. Muhammad Yaseen, Researcher at the Department of Information and Scientific Services, on the study of utilizing the role of modeling techniques in crowd management at the Grand Mosque. Besides, Dr. Ahmad Hatem Qadhy demonstrated the most prominent studies carried out by the Institute during the season of Ramadan 1439H at the Madinah branch. On the other hand, Dr. Yasser Shosho started his speech with thanks and appreciation to Dr. Abdullah Bafil for assigning him to attend the meeting on his behalf. He also hailed the researches and programs provided by the Institute during this year’s Ramadan season, which contributed to the service of the pilgrims and facilitated their performance of rituals. In addition, he appreciated the support provided to the Institute by the wise leadership, may Allah support it! In other words, such support would provide a beneficial study that contributed to the enhancement of the Hajj, Umrah and visit system. This would be achieved according to the National Transformation Plans 2020 and the Saudi Vision 2030. Moreover, Dr. Shosho wished that the meeting would come out with recommendations that contributed to the service of pilgrims and visitors. He pointed out that the Custodian of Two Holy Mosques Institute for Hajj and Umrah Research has been regarded as a lighthouse for more than 40 years. He added that it has been one of the main power centers in our beloved university, with its distinguished research cadres and researchers. Afterwards, the Dean of the Institute presented a souvenir to UQU Vice-President, who toured the Institute’s research departments and laboratories at the end of the event.